Excellent article! I can understand and agree 100% through the physics described in your detailed article and through personal experience that the low bar position allows the most weight to be squatted. I have, however, done cycles of front squats which, as also described in your article, work an entirely different movement pattern and musculature. After doing those cycles, my upper back felt much stronger, my hips got a bit of a break, and my posture was subsequently much improved from my normal shoulders & head forward resting position I've struggled with throughout life. I understand where you're coming from as far as training that which will contribute most to general strength development, but would you disagree that adding other variants would be beneficial in other ways, even if it's not using the most weight possible? Great read, enjoyed it very much, especially the part where you explain the mechanics. Thank you. We are not trying to asses who is the strongest, our goal is to get stronger. So absolute numbers don’t matter (to an extent), the change of those numbers matter. I would argue that your strength did not change. Nothing changed biologically that would increase your ability to produce force. The only thing that did change was mechanics and levers, as you outlined very nicely. The ability to produce the force needed was there all along. Lets take your hypothetical male who High Bars 375 and Low Bar Squats 400. Lets presume he only High Bar Squats for 4months and gets up to a High Bar Squat of 400 and increases his Low Bar by 10lbs. He got stronger by 25lbs. If instead, he only Low Bar Squatted for 4 months and now Squats 425lbs and 385, he also got stronger by 25lbs. The Low Bar Squat is only superior in terms of building strength, if you can increase the weight faster on a low bar squat than you can on a high bar squat. However I lack the experience and the knowledge to know the answer to that question. Just something I thought of while reading the article, have a great weekend! Thanks for the kind words, danny. I think that different variations of the squat (front squat, high bar, paused squat, pin squat, box squat, etc.) can all have their place in an intermediate or advanced trainee's program primarily as a way to manipulate volume and intensity. As a physical therapist, I have often used front squats with lifters who have suffered a back or hip injury as a way for them to maintain some sort of training effect while shifting some stress away from their injured hip or back. However, the main purpose of the article was to try and explore some of the differences in terms of the quality of the stress applied to the body by the three most commonly prescribed squat variants (LBBS, HBBS, FS). In doing so, my hope was to clarify why we use the LBBS as described in SSBBT as the primary means for developing strength in a novice population. All else being equal, the LBBS provides a higher quality stress that will drive improvements in strength far more efficiently than any other squat variant. As an athlete become more advanced and they develop more clearly defined goals, using different squat variations may have their place, but at that point, the athlete should have the information necessary based on their training history to make those kinds of decisions whereas novices by definition do not. Understood! I agree, novice LP should be 100% LBBS without messing with anything else. Now that I'm a few years in as an intermediate, I've noticed that adding in variations every once in awhile gives me a different training stress (which has actually helped with my LBBS) and also keeps training fresh and fun with some variety. It can be easily shown why the Sumo Deadlift is a less effective training tool than the Deadlift due to completely different biomechanics, path, and target muscle-groups. Thank you for the feedback, Leon. I really appreciate it. 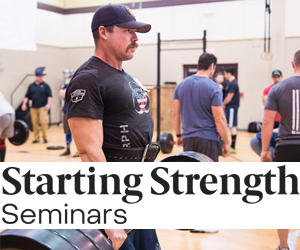 The point I was trying to convey with the line that you quoted in the article is that by regularly performing the LBBS as described in SS as opposed to one of the other popular squat variants, you will provide your body with the best possible stressor to induce a general strength adaptation and thus gain strength more efficiently. While I agree that you can gain strength using any type of squat, the amount of muscle mass trained and ultimately the ability to load it will impact strength acquisition. An article published by Hartmann a few years ago entitled "Influence of Squat Depth on Jumping Performance" inadvertently illustrated this point. When comparing the full depth back squat, front squat, and partial back squat, only the full range back squat group got stronger in both their own squat variant as well as the other two. This is an excellent example of the fact that strength is a general adaptation and how exercises that require the use of more muscle mass and facilitate heavier loads to be used have carryover to other tasks. In light of this research as well as my own personal experience, I would disagree that gaining strength in the HBBS and FS would drive up strength in the LBBS due to the fact that each require the use of less muscle mass and do not allow for heavier loads to be lifted than the LBBS. However, I have seen many instances of trainee's FS and HBBS go up without ever performing them simply by getting stronger on the LBBS. The line in the article is essentially to point out how something as simple as exercise selection can impact the results you will get from your training. I hope that clarifies my point a little bit for you. Pawn, that is an interesting question. While I can only speak for myself, I can tell you that I only use trap bar deadlifts or some other deadlift variation (usually rack pulls or block pulls) as opposed to conventional deadlifts with trainees who are dealing with a back injury and cannot pull from the floor with a barbell. While it may be true that some people can use a little bit more weight using a trap bar, I would argue that they do so while sacrificing the opportunity to strengthen the back and hip musculature to the same degree as they would pulling from the floor with a barbell as the mechanics necessitate a more upright torso and thus a smaller moment arm that the hips and spine must overcome to lift the load. If we are already regularly squatting as part of our program, I see the trap bar deadlift as being redundant in terms of the ROM and stress placed on the associated muscle mass. and moves the bar a similar amount. This is also not always the case. It depends upon the construction of the bar. Some of them have handles that permit a higher start position. As Petrizzo noted, the trap bar deadlift has more in common with a partial squat than it does the deadlift. It is not really a deadlift variant, but a squat variant. However, I have seen many instances of trainee's FS and HBBS go up without ever performing them simply by getting stronger on the LBBS. Even though I have written publicly about this on my IG about this many times, a lot of people assume I simply came out of the womb as an SS nuthugger, so let me state it again here. In early 2008, I switched from squatting 1/2 way down to squatting below parallel, but I did this exclusively with primarily high bar and a relatively small amount of front squatting. I had read SS but unfortunately no one else around me was doing low bar squats and I was influenced by the many crossfit and olympic lifting coaches whose work I followed, or who I knew personally, who all said the low bar squat is at best not very good and possibly even detrimental to getting strong for Other Things. Between the lack of anyone else to see doing it successfully and the unanimous chorus from people whose opinion I respected at the time, I only high bar squatted and occasionally front squatted. After approx 3.5 years of this, I had a 1RM high bar squat of 385. Which is half decent for a regular person, but certainly not very impressive for a 235 lb athletic guy, as I was at the time. At that point, in mid-late 2011, I switched to low bar squats exclusively. I trained the low bar squat as my sole squat variant for about 3.5 years (I performed a few scattered reps of high bar squat during this time, but very few and NEVER trained it), and by that time had squatted 535 for a 1RM low bar. I felt sufficiently advanced by that point that I added in two minor variants to manage and manipulate the stress on my low back: paused squats and high bar squats on my light day only. So even still, I never pushed them to the limit and never went heavy. I always purposely kept several reps in the tank on this light day. What I usually see happen is this: Someone switches from high bar to low bar, adds a bunch of weight to their squat, then tries to hit the same or almost the same weight that they did for low bar, on the very first time they high bar in several months or more. Then they don't, and they conclude it doesn't carry over. It usually takes 2-3 high bar workouts to re-adjust to the different form and ROM requirements of the high bar squat. Once you're 3 workouts in, maybe 4-5 at the most, if you added a bunch of weight to your squat doing low bar and it doesn't then carry over to high bar to the point that you PR, usually by a significant amount...well, that would be the first time I've ever seen that out of 100-odd crossfitters I've done this with. Last edited by Michael Wolf; 09-05-2017 at 01:20 PM.